2014 Senior from Union City High School, Michigan: Nolan Loss who has enjoyed playing baseball during his high school career. 2014 Senior from Union City High School, Michigan: Hunter Johns who enjoys playing baseball and hunting. 2014 Senior from Union City High School, Michigan: Austin Wolfinger who has enjoyed playing baseball and fishing. 2014 Senior from Union City High School, Michigan: Tyler Reilly who has been a part of the Cross Country & Track and Field teams. Quotes on My Images… What are your favorite quotes that you would like me to use? As some of you may have seen on my Facebook page, I have started to put quotes on some of my images. Some of you are thinking that you saw me do this last summer and you are correct! My plans are to do this more regularly and I would love to use some of your favorite quotes. You can comment on this blog post, send me an email (photographybychar@gmail.com) or post your favorite quotes on my Facebook page. We do need to give credit to who said the quote, so please include the name of the author or speaker for your quote. If you don’t know it, I will do some research and see what I can find. Comment and leave your favorite thoughts and quotes. Maybe yours will be used next with one of my favorite photographs and featured on Facebook! You will also find this post on my business blog for Photography by Char. Daily Prompt: Work, What have I been doing today? This is just 1 of almost 700 images that I have been processing from last night’s basketball games. You can find them under High School Basketball in the Sports & Events portion of my website. 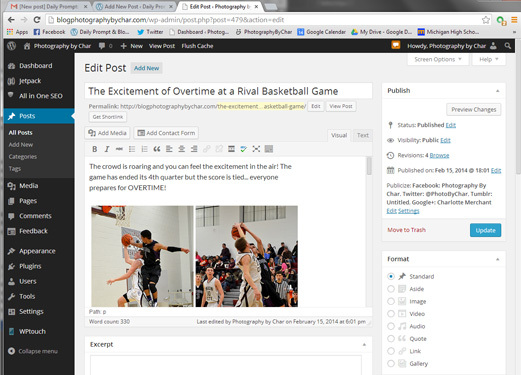 Plus I wrote a blog post for Photography by Char about one of the basketball games. You can read the post here. Now if I could only get a screen shot of my entire computer screen! You would find that I have several programs open. Earlier today I lost a bunch of work… not because my computer could not handle the load but because a program could not handle the load! Go figure!! and lets not forget… writing this post (Daily Prompt: Work) for my second blog. Now I need to get a few other things done too.